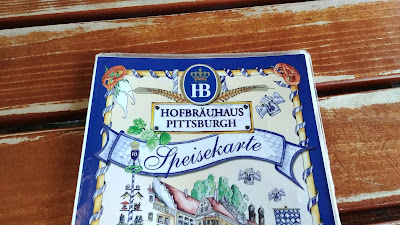 Last weekend, we decided to go to Hofbräuhaus. It had been 9 years since our first and only experience there. As you might guess from the long time between visits, we weren't much impressed in 2009. But suddenly autumn, pumpkin spice, fall, Halloween, Oktoberfest, it all was in my face and I ended up thinking going to Hofbräuhaus was a good idea. I did not realize it was actually Oktoberfest time. I did not realize that Hofbräuhaus was having Oktoberfest festivities the weekend we chose to go. We were in Kohl's, shopping for bedding, which always annoys me because I can never decide if something is soft enough, or warm enough, or light enough, or whatever. We decided to leave and go to dinner then stop at a different store on the way home. I checked No Wait. It said 10-20 minute wait. That was too soon to get in line because it would take us about a half hour to get there. The navigation system route to the South Side was a way we never go and it took us into neighborhoods I had never before driven through, probably because they were kind of scary. The entire drive, the No Wait app said 10-20 minute wait. As we were attempting to get around the blocked off streets and into a parking garage, I added us to the No Wait list. My text message, time stamped 5:11 pm, said 10-20 minute wait and advised me to arrive by 5:21 pm and check in. Okey dokey. We arrived at Hofbräuhaus around 5:20 pm. There was a line. To check in. It took SP 10 minutes to check in. At this point, our table should be ready, right? Right. But nope. SP maneuvered me through the line and inside near the "to be seated" podium so that when our table was ready, we do not have to get through the crowd. It was loud inside. Very loud. Too loud for my sensitive, old ears. I prayed we were not seated by the loud live music. At 5:50 pm, our table was ready. That was a 39 minute wait on what was supposed to be a 10-20 minute wait. Twice as long as the estimate. I was not pleased. What good is this No Wait app? Are they using it correctly? I should have put our name on the list when we left Kohl's. Then there was some kind of issue as 2 employees huddled and discussed where to put us (I guess that is what they were doing). It looked like they were going to lead us into the loud, live music area with communal tables & bench seating. This does not work for a wheelchair. I either have to sit on the end, sticking out into the walking "lane" and be kicked/jostled every time someone walks by OR everyone on my side of the table will have to stand up & slide the bench down (so the other end of the bench will stick out and be a tripping hazard) to make space for me to sit at the table. I was about to have a fit. Nope, they led us through that area and to the outdoor area. Outdoor dining. What had I said to SP as we went to dinner, before he checked in? I had said I didn't want to sit outside because it was so darn humid and I do not enjoy being out in that kind of humidity. It kills my appetite. It makes me feel slimy. Too bad for me, we were seated outside. Fine. I wasn't happy but I didn't want to wait even longer for a table inside the quiet, air conditioned area. I'd deal with the humidity and the loud outdoor music. There was some kind of metal bar across the bottom of the table that connected the left and right legs. It prevented me from getting close enough to the table. I was going to have to lean far over to eat, which usually ends up in my back hurting a lot, food in my lap, that sort of thing. Plus, I was very far away from SP. I didn't want to shout across at him and have everyone near us hear our conversation. I figured I could get my front caster wheels over the bar. Nope. I was repelled. So I backed up and with all my pathetic might thrust myself over the bar - and smashed my shin/knee into previously unseen thin, metal, crossed in an X shape bars underneath the table in the middle. It hurt. A lot. The pain took my breath away, which was probably a good thing because it meant I couldn't actually scream the curse words that were running through my head. I instantly backed up, grabbed my shin/surgically repaired knee, and put my head on the edge of the table to hide the tears coming. It was that painful. I was beyond angry at this point. I couldn't speak. I could only glare at everyone and hate everything about Hofbräuhaus. And then our server popped by to tell us the kitchen was really backed up so it would take a while for our food. Yay for telling us. But. How could they not be prepared to be slammed at what turned out to be Oktoberfest? We stayed. Gradually my pain subsided. SP gently and carefully got me over the metal bar so I could be close to the table and not have food in my lap. But later on when I tucked a napkin under my thigh so it wouldn't blow off my lap, raising my leg caused me to smash the other knee into the same bar. I ended up kind of enjoying the music but somehow I don't think that Oktoberfest celebrations in Germany include musicians playing "Sweet Caroline" and "Take Me Home, Country Roads." 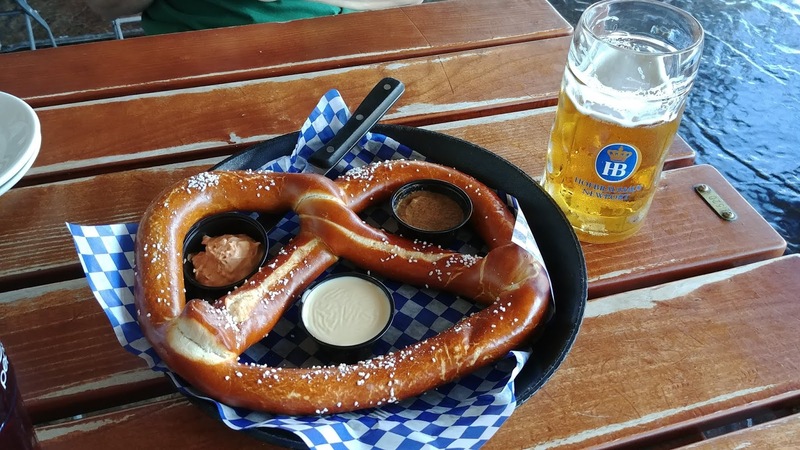 Giant Pretzel Combo (Giant pretzel served with “Obatzda” Cheese, Sweet Bavarian Mustard, and Signature Homemade Bier Cheese). I really liked the Obatzda cheese. Thanks to Wikipedia I now know that Obatzda is "is a Bavarian cheese delicacy. It is prepared by mixing two thirds aged soft cheese, usually Camembert (Romadur or similar cheeses may be used as well), and one third butter. Sweet or hot paprika powder, salt, pepper are the traditional seasonings as well as a small amount of beer. An optional amount of onions, garlic, horseradish, cloves, and ground caraway seeds may be used and some cream or cream cheese as well. The cheeses and spices are mixed together into a smooth mass. It is usually eaten spread on bread or pretzels. Obatzda is a classic example of Bavarian biergarten food." 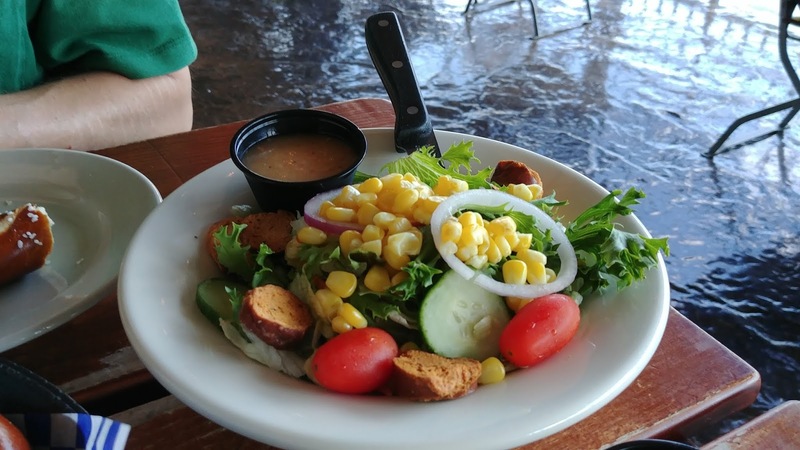 Haus Salad (Hofbräuhaus Salad Mix, Red Onions, Grape Tomatoes, Cucumbers, Sweet Corn, Homemade Seasoned Pretzel Croutons, served with House Cucumber Dressing). 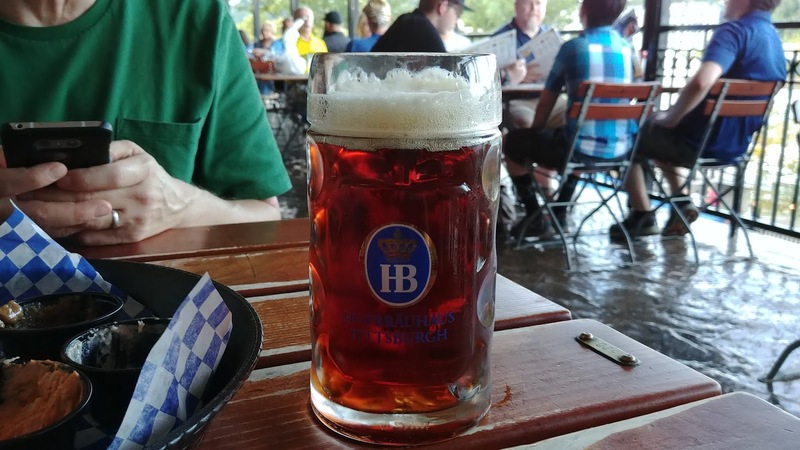 SP's second beer was a Märzen, a lager that originated in Bavaria, has a medium to full body, may vary in color from pale through amber to dark brown, and is the beer traditionally served at Oktoberfest. 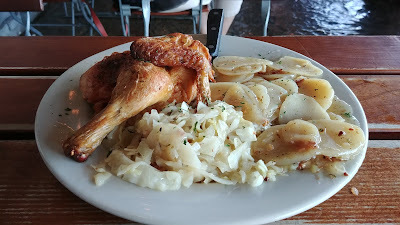 SP ordered the Oktoberfest special Roasted Half Chicken served with German Potato Salad and Fried Cabbage. 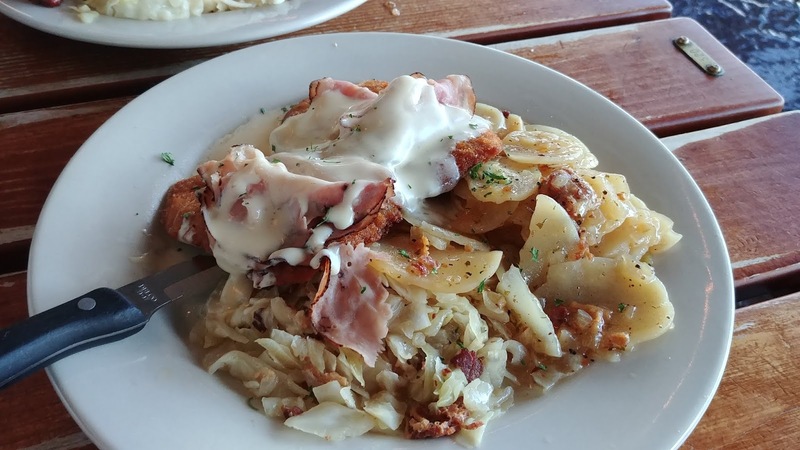 I chose Bauern Schnitzel (Breaded Pork Cutlet fried crisp and golden brown, topped with Black Forest Ham, Swiss Cheese, and Signature Homemade Bier Cheese. Served with German Potato Salad and Fried Cabbage). I was full but SP wanted dessert so I let him choose. He chose Apfel Strudel (Traditional German Apple Strudel, imported from Bavaria and served warm with Vanilla and Raspberry Sauces). 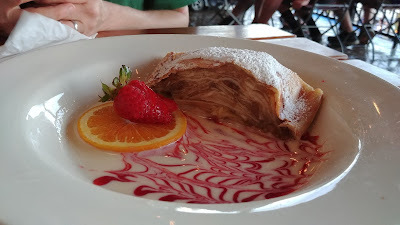 I didn't expect strudel to be served swimming in a sea of sauce (I guess I thought the sauce would be on the side? ), but apparently it is not inauthentic (I Googled it). I did find the strudel to be too mushy for my liking, not cinnamony enough, and I would have preferred no sauce. 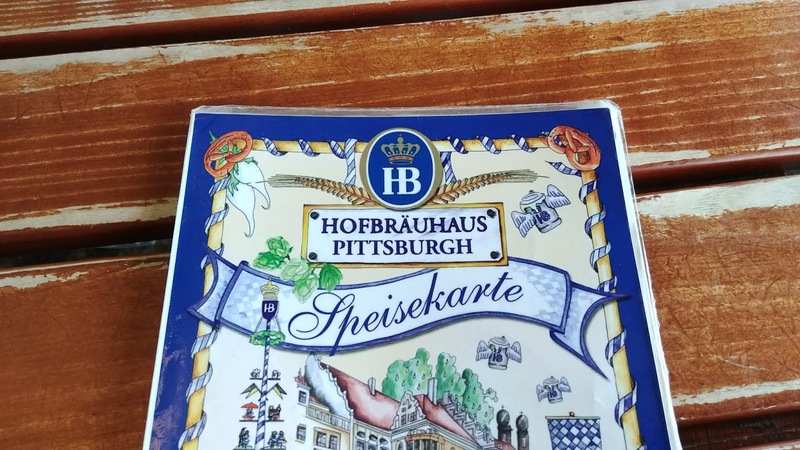 Hofbräuhaus. I do not know what to say. I liked my meal and the pretzel & sauces. The iced tea was fresh brewed. SP liked his food and his beers and remembering his trip to Oktoberfest in Munich many years ago. The outdoor seating ended up not being as awful as we expected because there were lots of ceiling fans and a breeze seemed to be coming off the river, but it was still pretty humid as evidenced by the sweat coming off the sides of our cold beverages. We used a lot of napkins to mop the table and the sides of glasses and were extra careful to not have the huge, sweaty glasses slip from our hands. Our server was friendly and quite nice. She did update us on our food and apologized (we didn't actually get our meals until almost 7 pm). We finally left a bit before 8 pm. But the wait. The slow kitchen. The loud music inside, it reminded me of why I hated going to bars in my 20's (too loud to talk to people or hear yourself think). And the not wheelchair friendly table. My knees were not happy.